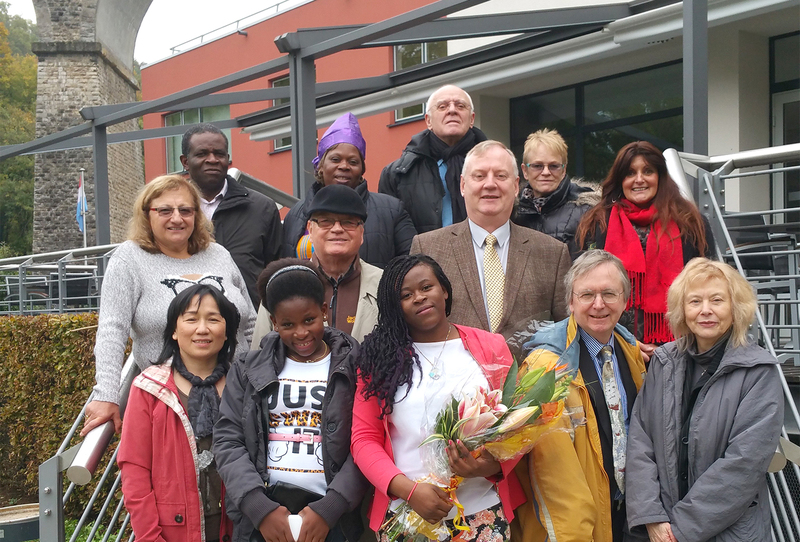 By FFWPU Luxembourg, Alan and Brigitte Sillitoe: On October 18 2015, we had the pleasure of welcoming our regional president, Reverend Jack Corley, to Luxembourg, where he gave the sermon at the Sunday service. We do not have a center here; however, we were fortunate to be able to rent a room at the Youth Hostel situated in a picturesque part of Luxembourg for the occasion. However, reverend Corley, knowing that we usually hold services in members’ homes, encouraged us to continue doing so because of the better spiritual atmosphere to be found there as opposed to a public place. After showing a moving video about the 3rd anniversary of True Father’s Seonghwa, Reverend Corley referred to the ending of the well-known movie, Ghost, in which Sam (Patrick Swayze) basically says that love is the only thing we take with us to the spiritual world. He went on to expound on this theme, explaining that if we really practice true love during our life on earth, then we can feel comfortable about going to the spiritual world, defining true love as living for the sake of others. He suggested that if at times we do not feel God in our lives, although prayer is good, the best way forward is to do something to love others, referring to 1 John 4:20, “Whoever claims to love God yet hates a brother or sister is a liar. For whoever does not love their brother and sister, whom they have seen, cannot love God, whom they have not seen”. This essentially corresponds to the foundation of substance in Divine Principle, which is the point where most people failed in history, even though they successfully accomplished the foundation of faith. He also spoke about the difficult course True Mother has had to go and testified to how she has kept her focus even under such trying circumstances. He mentioned that the 3rd anniversary of True Father’s Seonghwa was the first time for him to participate in such an event as continental director and that, as such, he had more opportunity to meet with True Mother directly. He explained that on this occasion True Mother looked quite joyful. She said, “After 3 very difficult years, I now feel much lighter”.